Encore’s student roadside assistance programs can give you peace of mind when your son or daughter is on the road. With our student roadside assistance memberships, your children will receive comprehensive, nationwide coverage 24 hours a day, 365 days a year! In addition to breakdown assistance, our roadside service plans for students also cover a variety of other services, including fuel delivery, flat tires, lock-outs, dead batteries and more. Choose from our classic Encore Roadside program or Encore Now, our instant program designed to waive our brief waiting period to dispatch help when you need it the most – right now! Your son or daughter will also love the convenience of our student roadside assistance plans’ mobile app and virtual member card. In the case of a breakdown, our members can simply open our app and dispatch a service provider – we can quickly pinpoint the driver’s location! We pride ourselves on exceeding the expectations of our members – enroll today to receive coverage from a motor club you can trust! To learn more about our student roadside services plans and pricing, contact us online with your questions. Nationwide, 24/7 Coverage: Is your child going to a university out of state, or planning a road trip with their friends? Don’t worry – our student roadside assistance memberships include 24/7 coverage anywhere throughout the United States, Canada, Mexico, Puerto Rico and even the U.S. Virgin Islands. Shopping Discounts and Other Perks: At Encore, we like to show appreciation for our members – that’s why we offer a variety of discounts and deals on travel, popular name brands, and movie tickets! 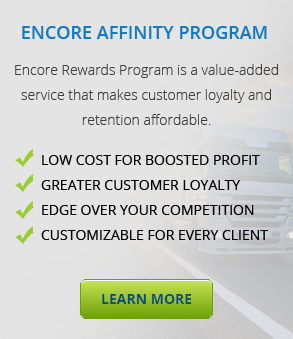 In addition to our full-service student roadside assistance plans, Encore also offers programs for the whole family! Find out more about why so many prefer Encore Protection’s roadside assistance services – contact us online to connect quickly with our representatives!